Errol Brickworks was a traditional 19th century Brickworks. It was one of the last to close, in 2010. The Errol Brickworks in Scotland were also known as Inchcoonan Brickworks and Errol Brick and Tile Works. They started off in the 1850s making drain pipes, but eventually all sorts of bricks and tiles. Brick-making was actually introduced by the Romans, and revived in the 16th century by traders from the Low Countries. The parish has examples of brick farmhouses dating from the late 18th century, with a rare mid-century survival at Flatfield. Clay was extracted from the pits on the east side of the road. Why are these beehive kilns so tasty? Well, partly because there is now a crisp factory on site, but mainly because they are quite rare. Errol Brick Company is the only survivor of a group of 19th century brickworks in the area: the others were Pitfour Patent Brick Company, Megginch, Waterybutts and Nether Mains of Inchture. 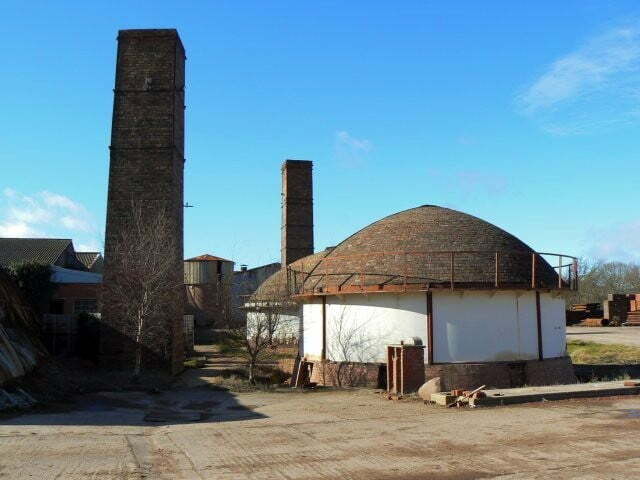 The kilns at Errol Brick Company consisted of: 1 rectangular downdraught kiln, 2 round downdraught kilns, 1 tunnel kiln and 1 modern shuttle kiln. It is now thought that only the pair of 1950s beehive kilns and 2 chimneys remain. The beehive kilns were capable of holding from 10,000 – 100,000 bricks per load, and were also used in the production of large drain pipes. The method of firing from the side led to massive heat variation, with the sprung roof expanding by 1.5″. If you get your kicks out of bricks – you can find out more – HERE! The clay pits are now being reclaimed by nature and make for a fabulous habitat or two! There is a path from the brickworks through the wooded area across the road that takes you to the clay-face. Could be dangerously deep water here – you have been warned!